Senior Sri Lankan journalist Ameen Izzadeen explains why the popular general and popular President fell out just months after masterminding the end of the LTTE. Sri Lankans now know why their highly-respected war hero wants to quit his top military post and serve the people in some other capacity, possibly as their next President. According to a leaked version of what is said to be General Sarath Fonseka's retirement letter to President Mahinda Rajapaksa, it all boils down to the government's fears of a military coup and its mistrust of Sri Lanka's first and only serving four-star general. The tone of the letter indicates that the general was highly perturbed when the government last month alerted India on a possible coup in Sri Lanka and sought its help to thwart it if it happened. The letter fired a 16-canon salvo at the President -- a kind of you did this to me, you humiliated me, you mistrusted me and you gave me a post that had no command responsibility. The letter pointed to the recent replacement of soldiers loyal to General Fonseka with soldiers from a regiment which was close to President's brother and Defence Secretary Gotabhaya Rajapaksa for security duty at army headquarters. It also had a political tone aimed at wooing the Tamils, many of whom probably love to hate him. The general told Rajapaksa, his commander-in-chief, that he won for him the war but the President failed to capitalise on it and win the peace. 'Your Excellency's government has yet to win the peace in spite of the fact that the army under my leadership won the war. There is no clear policy to win the hearts and minds of the Tamil people, which will surely ruin the victory, attained (sic) paving the way for yet another uprising in the future,' the leaked letter said. The general's disgust and the government's fears of a possible coup date from the beginning of the final phase of the separatist war. As the Sri Lankan armed forces scored victory after victory, General Fonseka, who in 2006 survived an LTTE assassination bid, emerged as a super hero and became more and more powerful. So much so, the President seldom said no to his requests. Some months before the war ended, Rajapaksa honoured a senior editor with a top diplomatic posting in Pakistan. The editor and his family took wing to Islamabad. But no sooner he assumed duties than the editor received a letter from Sri Lanka' foreign ministry, asking him to immediately return to Colombo. No reasons were given why he was being called back. The editor later learnt that it was General Fonseka who told the President to do so because the editor had once blamed elements in the army for the abduction of a defence columnist who worked for him. The power General Fonseka wielded during the war was such that many asked whether the civilian leadership was in awe of him. Analysts who were close to Rajapaksa would opine that the general was more powerful than the President. A Machiavellian to the letter, Rajapaksa let the general have his say, but he always had an eye on his movements and waited for the opportune moment that he foresaw as coming after the war victory, to clip his wings. Less than two months after General Fonseka's troops successfully ended a 30-year war with Tamil militants, the President 'honoured' him with a gazetted position of Chief of Defence Staff. It took a few days for the general to realise that he had been misled and kicked upstairs with a position without power to command the armed forces. Moreover, in terms of the CDS Act, the general could act or advise only with the consent of the defence secretary, the President's brother, who was junior to General Fonseka in the army. In his letter to the President, General Fonseka said he was humiliated by the promotion. This was how the General describes his humiliation in the leaked letter. 'Further, prior to my appointment I was mislead (sic) on the authority vested with the CDS. I was made to understand that the appointment carried more command responsibilities and authority than earlier, but subsequent to my appointment a letter by the Strategic Affairs Adviser to the defence secretary indicated that my appointment was purely to coordinate the services and not that of overall command. grant me with command responsibilities which leads to believe in a strong mistrust in me, which is most depressing after all what was performed to achieve war victory. Many analysts also believe the promotion of the general as the CDS was linked more with the fears the Rajapaksa brothers had about a military coup than with any intention to promote the general. Two weeks before General Fonseka was given the post, the state-run Daily News carried on its front page the story on the military coup in Honduras on June 28. That a distant country with which Sri Lanka had hardly any diplomatic or trade relations made news on the front page of a state-run newspaper was no accident. Neither was it a sub editor's desperate attempt to fill space on a news-starved day. The story was included by the government to send a signal to the highly-popular general who still commanded the respect of the rank and file of the army that the government was prepared to face any eventuality. Not used to such indirect salvoes, the general felt that he was being used and discarded by the government. As days passed, the rift deepened. The gap between the President and the general continued to widen with government ministers at pubic meetings saying that it was because of President Rajapaksa's leadership that the army was able to defeat the terrorists. The general felt such remarks were distinctly a bullet below the belt. The remarks prompted the general to say that 95 percent of the credit for the victory should go to the troops. Fishing in the troubled waters was the opposition. It succeeded in netting in the general and held secret talks aimed at fielding him as the common opposition candidate if and when the President announces the election. With many in the opposition holding the view that the United National Party leader Ranil Wickremesinghe would cut a sorry figure contesting Rajapaksa at the polls, General Fonseka became their obvious choice. Even the Marxist Janatha Vimukthi Peramuna has hinted that it will support Gen. Fonseka as the common opposition candidate, notwithstanding its ideological differences with the free-market UNP, Sri Lanka's Grand Old Party. Rajapaksa was obviously agitated by the news. Suddenly the glow on his chubby face disappeared and dark patches appeared under his eyes, indicating that he is now a worried man. The counter offensive began. Last Thursday, hours after the general returned from a controversial visit to the United States, he was engaged in a war of words with the defence secretary, according to the Sunday Times newspaper. The duel was not about the US Department of Homeland Security's request to General Fonseka to be a 'source' in a possible war crimes probe against the defence secretary, a US citizen, but over a question of discipline in the army. Billboards that showed a jubilant Fonseka with his heroic troops disappeared from busy junctions. His pictures on billboards where he was seen with the President and his brother Gotabhaya, were tarred or torn. A hero has become a zero in the eyes of the government. 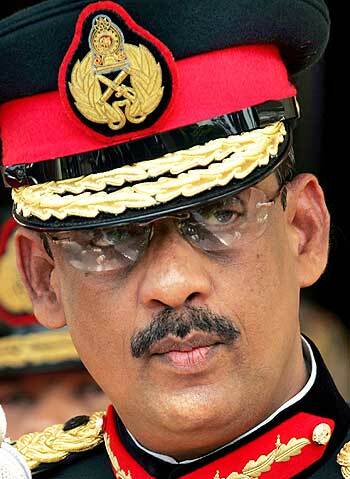 But the real battle will begin in the coming days after General Fonseka makes his political intentions clear. An indication of his intention was found in the final paragraph of the letter. The rift between General Fonseka and Rajapaksa has not gone down well with the masses, especially the Sinhala majority, who regard both as war heroes. The ultra nationalists' ire is aimed at the opposition whom they accuse of dividing the Sinhalese. They even tried to get the chief Buddhist monks to issue a 'Sangha order' -- an edict -- urging General Fonseka not to enter politics. But General Fonseka is as ultra nationalist as those who blame him for flirting with the opposition alliance -- which include parties representing the interests of Muslims and Tamils of Indian origin beside the UNP and former foreign minister Mangala Samaraweera's Sri Lanka Freedom Party Mahajana Wing, a breakaway group of the ruling party. A majority of the Tamils, many of whom were hurt by the vulgar jubilation displayed on the streets following the victory, see no difference between Rajapaksa and Fonseka. Disturbed by the deaths of thousands of innocent Tamils in the last days of the war and the suffering of hundreds of thousands of displaced Tamil people in camps, a majority of the Tamils are unlikely to support either of the candidates. However, the opposition alliance is trying its best to woo the mainstream Tamil party, the Tamil National Alliance, which was once regarded the mouthpiece of Tamil Tigers in Parliament. A majority of the Tamils also feel that neither candidate is committed to finding a solution to the Tamil problem by devolving power, despite the pro-devolution UNP's presence in the opposition alliance offering them a glimmer of hope. Another factor which worries the government is the possibility of certain state secrets coming out to the open in the heat of the election campaign. This might be damaging, especially in view of the international human rights community's call for war crimes probes against the Sri Lankan government.